of beef and a red wine reduction. NEIL McGuigan, the extraordinary driving force behind the McGuigan Wines label that's been named International Winemaker of the Year for a record three times (2009, 2011 and 2012,) has now come up with another reward for wine aficionados – a Claret-style red (yes, Claret – remember the name?) that he's been quietly working on with his Hunter Valley winemaking team for an amazing ten years. Labelled The Philosophy, this 2010 Cabernet Sauvignon Shiraz blend of super-premium fruit from South Australia's Eden and Clare Valleys, fulfils a decade-long challenge both to himself and his team: to create an icon wine that goes beyond anything else, and recognising not the makers, but the wine as the hero. "I named it after my own philosophy: that every day you need the ambition to craft a super-premium wine, spreading that focus through every step of your winemaking process, so your $10 wine starts tasting like a $12 wine, the $12 like a $15 and so on to every wine from your lower price levels, to your very best super-premiums." spicier dishes or those with stronger Asian influences. The 2010 The Philosophy is a wine strong on blueberry fruits without being overly sweet fruited, fine tannins and an incredibly long palate; well rewarding the $150 asking price, but with only limited availability, it's worth getting hold of now to make the most of any particularly special occasions coming up in the next year or so. ONE TO NOTE: CHOOSING a wine to go with spicier dishes, or with many of those with stronger Asian-influences, can often prove somewhat of a challenge, but one that takes-on such challenges really well is Gewurztraminer – and Rymill's just- released 2013 Coonawarra gt (the gt for Gewurztraminer) does just that trick. Layered with lovely aromas from rose petal and orange blossom, to freshly-cut lemons and limes, it's the wine's palate of juicy pink guava, papaya, lychees and zingy citrus that stands up, takes-on, and tempers those spicier foods. At $21.50 it's a top-drop to enjoy now with that next normally challenging spicy or stronger Asian meal. And it'll develop even further withanything up to a decade in the cellar. IN his continuing search for the more weird, wacky and wondrous in the world of travel, David Ellis says Hunter Valley winemaker Neil McGuigan has long extolled the value of having a winery cellar door – and while his gets 120,000 visitors a year, he says he was gobsmacked on a recent overseas trip to find out just how valuable. 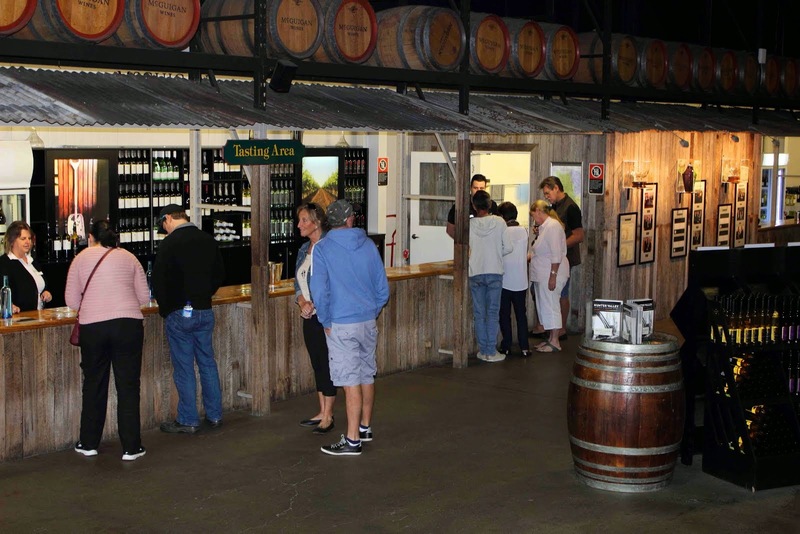 "I was in Bangkok, and after a winemakers dinner two Scottish people came up to me after they saw our McGuigan banner and said they'd just visited Australia, been in the Hunter, visited our winery and, yes, bought some of our wine. "Then a couple of days later in a taxi in the UK the driver saw my McGuigan shirt motif, said he'd been in the Hunter nine years before – and that he'd bought two cases of my wine. "Blow me, a couple of days after that in Belfast I'd been launching our Black Label Reserve wines to the media there, mentioned the value of a cellar door, and after a story appeared in a local paper about it, a blogger put up that he'd been to our cellar door just a month earlier." Finally on his return to Australia, Neil was promoting his wines in Melbourne to managers of a supermarket chain, when one told him he'd just come back from the Hunter – and yes, visited McGuigan's Cellar Door and done a nice little bit of personal buying. dishes, this one's great $25 buying. AN interesting and rewarding sparkling out of Italy that's quite fruity yet at the same time nicely soft and dry, is Carpene Malvolti's Prosecco 1868 Extra Dry, and which sells here for a very agreeable $25 a bottle. Founded in 1868 in Italy's Veneto region by Antonio Carpene, the company became the first in Italy to submit traditional still wines made from Prosecco grapes to the sparkling process; over the ensuing 146 years the company's been handed down from father to son and still remains firmly in Carpene family hands today. Fruit for this bubbly, that's equally at home in the party-room and at the table, came from the picturesque Conegliano and Valdobbiadene hills of Veneto, and was produced under the Charmat method in which the wine is secondary fermented in bulk tanks and bottled under pressure; it is fruity, extra dry and aromatic, with strong hints of apple on the palate and bouquet. Perfect as an aperitif, a party-room bubbly or at the table with light Mediterranean dishes – very popular in its home region is to share it with an octopus and potato salad – it is also equally at home mixed into cocktails with the likes of cranberry or orange juice, lemon-lime-and- soda, and a host of others. Beef Wellington or steak and kidney pie. ONE TO NOTE: PETER LOGAN has come up with a great drop in his recently-released 2012 Logan Weemala Shiraz Viognier that's got a lovely silky palate of red berries, plums, bay and tarragon and a nice long finish – and as we know, the longer the finish (the time the flavour lasts in your mouth) the finer the quality of that wine. Peter grew fruit for this one at Mudgee 600m up in the Central Ranges of NSW, an area that produces reds with uniquely rustic characteristics and usually stronger savoury elements than most other regions, and which are recognised for strong acid, tight tannin structure and generous flavours. At $19 this is a good-value lip-smacker to enjoy with cold-weather favourites such as Beef Wellington or a hearty steak and kidney pie. AUSTRALIANS are taking increasingly to the enjoyment of sparkling Rosé, a wine that can have an almost additive allure to it, and one that can prove wonderfully rewarding both in a party-room environment and at a celebratory dinner table. 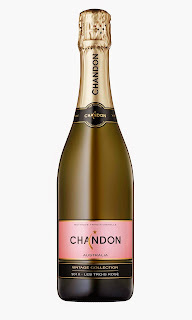 Chandon have recognised this and last year released a new label it called Vintage Collection, which it dedicated to bubblies that it saw would be a distinctive and exceptional expression of each season, the first being a 2008 Chandon Cuvee 500. Now its released its second Vintage Collection, a 2010 Chandon Les Trois ("The Three") Rosé – a blend of maritime climate Tasmanian Chardonnay and Pinot Noir giving acidity and freshness, Chardonnay from Victoria's King Valley whose high altitude Whitlands Plateau add complexity, power and weight, and cool Victoria Upper Yarra Valley Pinot Noir that rounds out all this with characters of floral and spice. 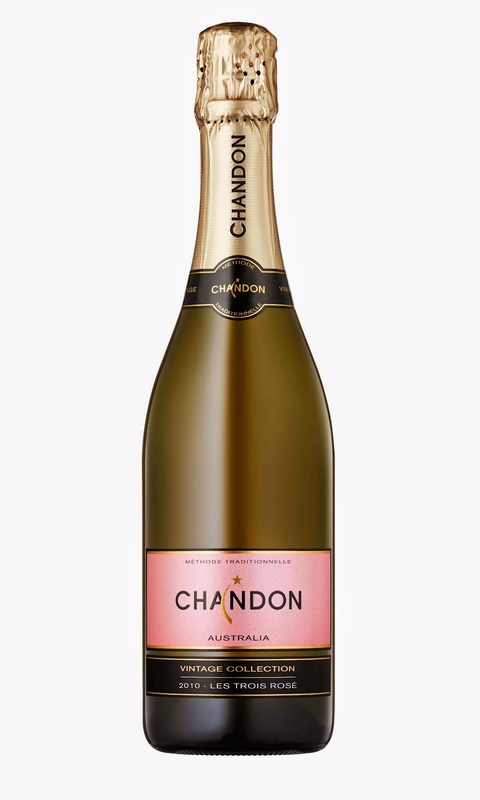 "We believe we've brought together a beauty and interest in flavours which are uniquely Australian," said Chandon Senior Winemaker, Dan Buckle. "The interplay between these three regions makes for a really interesting expression of sparkling Rosé." He's spot-on; pay $45, and let the celebrations begin. cheeses or rosemary-infused lamb roast. ONE TO NOTE: WA's Margaret River Forester Estate has released a fab 2009 Yelverton Reserve Cabernet that is a marvellous drop to settle down with in front of the tele with a selection of matured hard cheeses, or if you are dining with family or friends, with a rosemary-infused lamb roast or rare beef fillet steak. With currants, bay leaf, menthol and savoury oak on the palate, this wine developed real character through being stored in temperature-controlled cellars for four years before release. A great drop that's well worth the $62 asking price. And while wonderfully and rewardingly enjoyable now, with careful cellaring you'll find it even more so in three or four year's time. – in particular chargrilled meats. SIDE BY SIDE is an interesting new label from Brothers in Arms at Langhorne Creek in South Australia, and whose Metala Vineyard is one of the oldest in Australia – William Formby buying the property 130-odd years ago, and first planting grapes there in 1891. Today his great, great grandson, Guy Adams is the fifth generation to live on and work Metala – side by side with his wife Liz, with the farm still side by side with the vineyard, and the vineyard in turn side by side with the winery. Little wonder they chose the name for their new label, recently releasing under it a Cabernet Sauvignon, a Shiraz and a Malbec, all nicely priced at $27 a bottle each. Their 2012 Malbec is a beauty, reflecting why Malbec is grown more in Langhorne Creek than any other Australian wine region. Fruit for this one came off vines planted 12 years ago, the resultant wine a lovely floral and fragrant style, and which, as Liz says, is simply made for foods, chargrilled meats being particularly suited to it. with roast chicken, pork spare ribs or white fish. ONE TO NOTE: LERIDA Estate in the Canberra District's Lake George has released a ripper 2012 Chardonnay from a vintage that owner Jim Lumbers sums up as "simply magnificent," with perfect dry and cool conditions supplemented by plenty of days of bright sunshine. And as bizarrely as it does, Lake George – despite the dry – mysteriously filled with water for the first time in a decade in 2012, continuing to confound the locals. This 2012 Lerida Chardonnay is a wonderfully fruit-filled, crisp and mouth-filling wine that epitomises just why Chardonnay is the world's most-appreciated white wine when it comes to easy matching with food – and in this case one that reflects the contradictory nature of cool-climate Chardonnay by boasting both fruit and minerality. Pay $24.50 and match it with roast chicken with a rosemary stuffing, pan-fried pork spare ribs or white fish.